A “bright, virtually perfect image…immune from recoil and just about anything else” is how experts describe the Nightforce ATACR™. Its ED glass and virtually indestructible construction have distinguished the ATACR™ (Second Focal Plane) as the ultimate precision instrument for long-range shooting among military, tactical professionals and civilian shooters alike. Now, the ATACR™ will allow you to achieve the same kind of extreme performance from your hunting rifle. Its resolution and clarity, in a second focal plane configuration, will fully realize the capability of the flattest-shooting hunting cartridge. 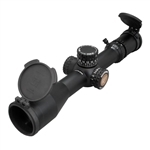 If the terms “high ballistic coefficient,” “low standard deviation” and “match grade” distinguish you from the ordinary hunter, then you’ll know why “extra-low dispersion glass,” “repeatable adjustments” and “impact testing” distinguish the ATACR™ (Second Focal Plane) from ordinary riflescopes.